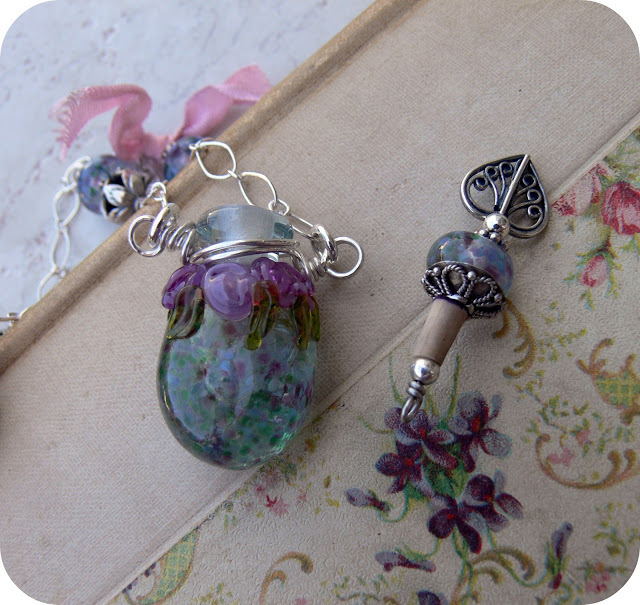 Pretty Things: Last Cup of Bead Soup with Lutka and Co.
You can see what I made with the big purple dotted beads by clicking here and what I did with half of the pink strand by clicking here. OK. Up first is the other half of the pink strand. My first instinct was to go to my tried-and-trued, the dangly charm bracelet. 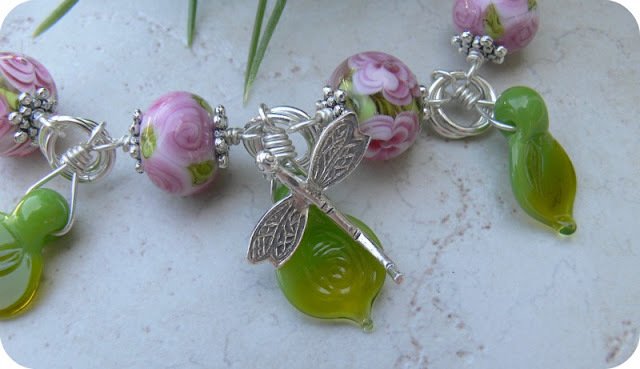 I love anything with dangles, as we all know. However, that would be sort of like cheating. So I did the unexpected -- I decided to do dangles, but stole the green leaves from the purple flowers for the dangles. I added an errant silver dragonfly, and you get "Garden Party". The dragonfly is purposefully off-center because that's how I roll these days. It sits quite firmly on that leaf and don't ask me how I did it because frankly, I couldn't tell you but it required wire and a bit of swearing (no children or pets were harmed in the making of this necklace). And there you have it. I split two sets into two. And just realized I shot the photo with the leaves flipped the wrong way. Dang. But trust me, it's gorgeous when worn correctly. Next is the perfume bottle. This was a challenge. I cut off the wire that came wrapped around the bottle because I had another idea, which quickly failed a miserable death, so it was back to wire. I quickly learned just how DIFFICULT it is to wrap these bottles -- or, at least, for me. Took a couple times. I then decided to give the bottle cap a more Victorian flair and redid the top with a long headpin I had. 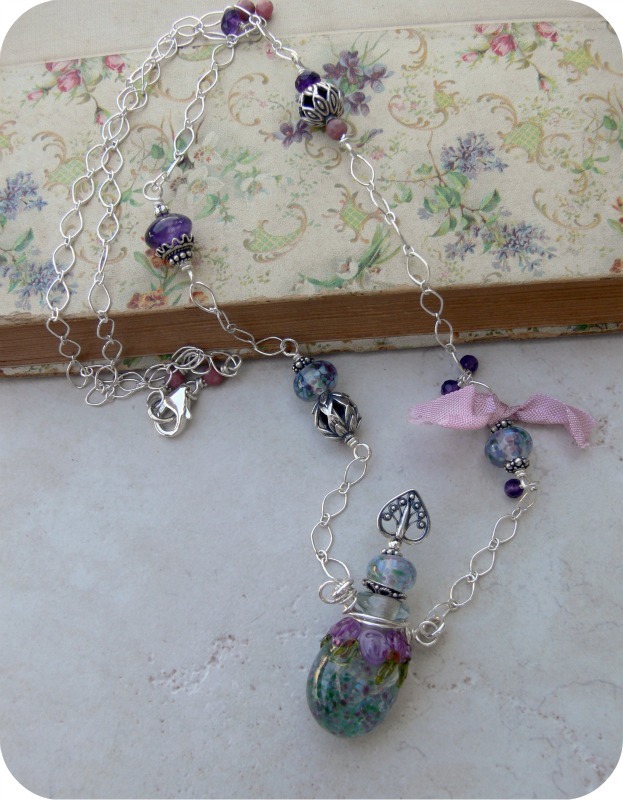 The rest, I left mostly chain, but with bits of silver, rhodonite, and amethyst and a tiny bit of pink ribbon. I saw SO much fiber and ribbon in the Bead Soup Blog Party and I've always wanted to try it but have just failed miserably, so I thought I'd start small. So here is "Amphora". Now, this last piece is hands down my favorite. I don't know if it's the style or what, but I'm pretty sure it's the color combination. It's (to me) unexpected. I really wanted to rock those purple flower beads and this entire concoction came about so randomly. I started with one idea and ended up SO far in left field for lack of the proper elements -- but I really, really, love it. It needs a name -- anyone have one? It may not look like much, but worn, it's so cool. That sea green GLOWS. The flowers hang just so. And the chain is JUST the right openness. And to tie it all together, earrings. Overall, I'm really tickled with these recipes of soup! I really love that last necklace! the colors are so vibrant, its just beautiful! Love the third one too, though they are all very pretty. 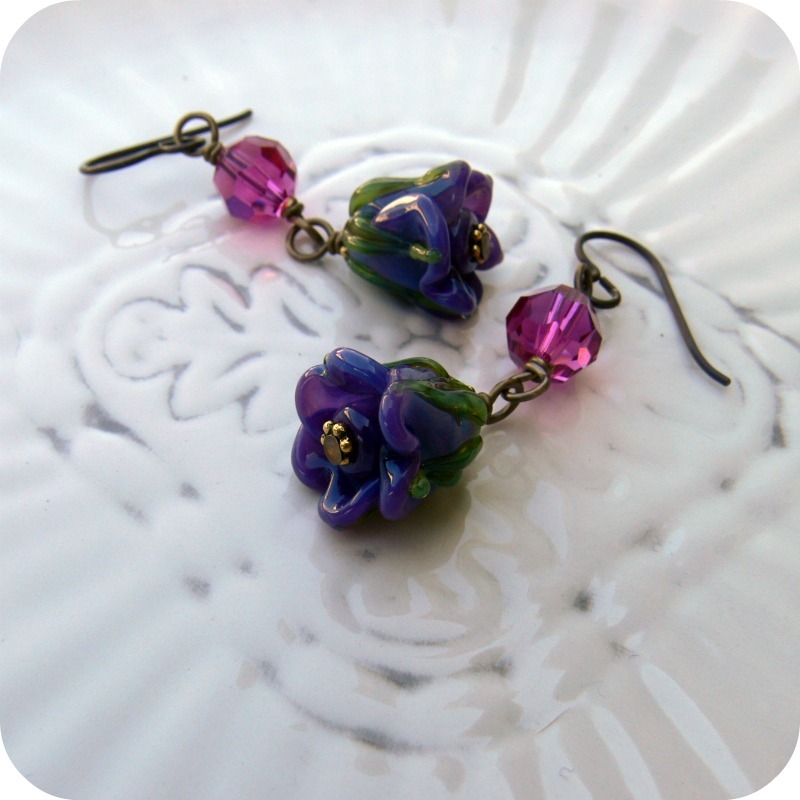 'Purple Rose' is my name for it, love those earrings. Title for necklace "Once in a blue moon". There is a rose called blue moon, and happy accidents don't happen that often! Great work Lori. 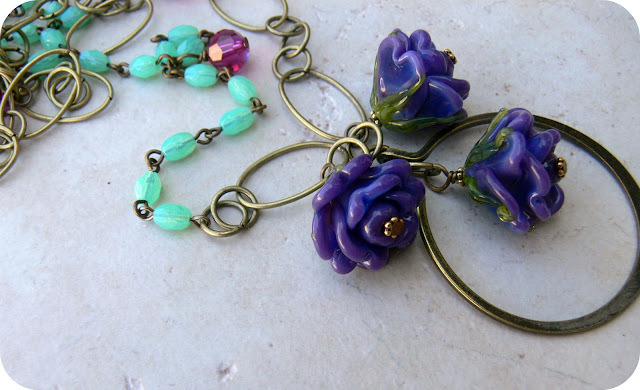 I'm not a big fan of pink personally but it does work so well with green, and I just love the purple flower set. As for a name how about 'Violetta' from La Traviatta - the strong rich purples for the courtesan and the softness and openess for the frailty she succumbs too. Just a thought. Thank you for featuring me as the cup bead soup artist! 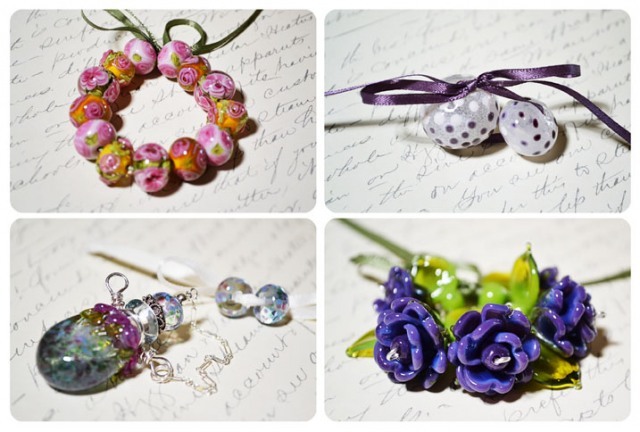 It really is wonderful to see what someone else comes up with, with the beads I make. I love all your creations! Linda - Lutka And Co.
How about "Far Off in Left Field" for the name for the necklace?! 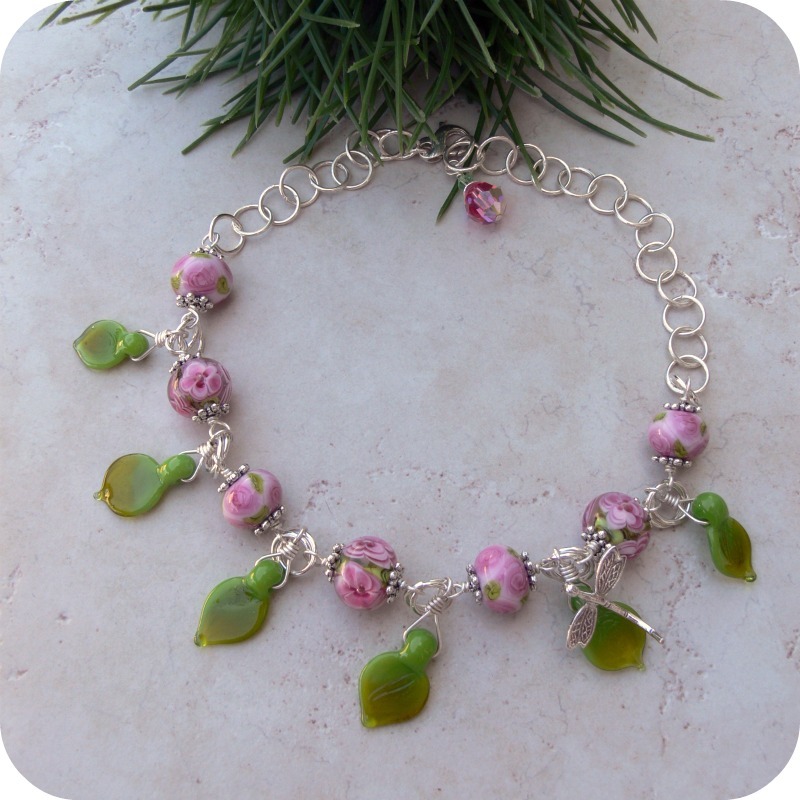 :-) Or "Flowers in Left Field"...or just "Left Field"....LOL Beautiful pieces, as always! What absolutely beautiful pieces! I love the perfume bottle one especially. Beautiful!! I love the last necklace and earrings! These are all so gorgeous - I love the bottle one the best - but I'd wear them all!! Beautiful work! I love the perfume bottle necklace...gorgeous! Lori, All three of your pieces are just gorgeous. My favorite is a toss up between two and three. I just can not decide which I like better. When I saw necklace three the first and only name that came to me was Sophia, such a pretty name for a pretty necklace. Lori, all three pieces are really beautiful! And you added a touch of the unexpected in each!
" Ring around the Posy"? Do you know the song- Ring around the Rosy? That popped in my head while looking at your nameless beauty. Love the colors and design and the bottle piece is gorgeous!! Bravo with the touch of ribbon. I am slowly reading down to your bead soup list. Still hopping. I am taking my time and enjoying each blog. Wow, these are GORGEOUS! 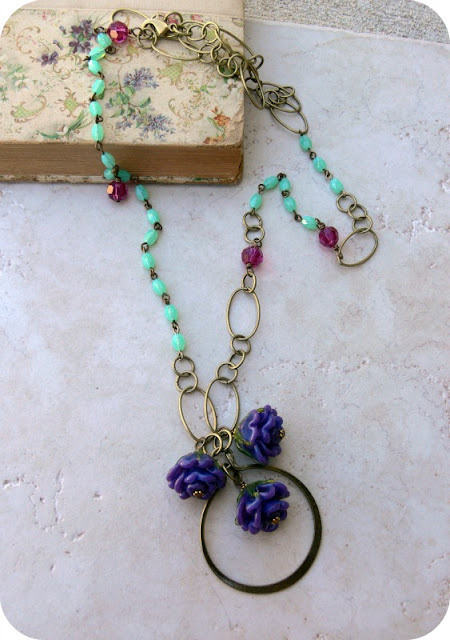 I absolutely love those purple flowers with the pink earrings, and that necklace!! What a popper! BUT....I have noticed the book you used for your background!!!! OH my..., now I collect those kinds of books....would you want to let me purchase it for my collection??? I think something to do with Atlantis would be perfect. For the sea foam green beads that glow and the whole thing flows so prettily. Also, Atlantians would be proud to have worn something so amazingly beautiful. You to wonderful work Lori. Thanks for sharing.